Anti-Defamation League (ADL) National Director Abe Foxman expressed on Tuesday the League’s deep dismay at UN Secretary-General Ban Ki-moon’s “stunning” bias in his recent remarks on the Israeli-Palestinian conflict. “The Secretary-General showed a stunning lack of objectivity on the issues surrounding the reasons for the recent violence in Gaza and inexplicable silence when it came to the Palestinian policies and actions which brought us to this point in the first place,” Foxman said. In a letter sent to Ban, the ADL said it was troubled by his failure to take a definitive stance against the PA’s intentions of joining the International Criminal Court in The Hague. 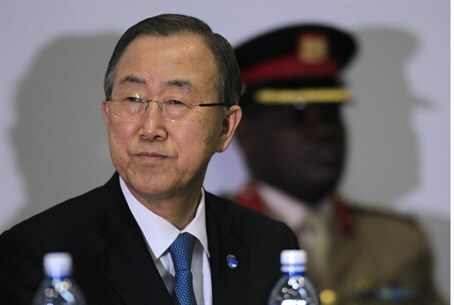 Ban said on Sunday that the Israeli “occupation” is responsible for the recent war in Gaza. “We must not lose sight of the root causes of the recent hostilities: A restrictive occupation that has lasted almost half a century, the continued denial of Palestinian rights and the lack of tangible progress in peace negotiations,” he said, according to AP. Prime Minister Binyamin Netanyahu fired back at Ban Monday by noting that the entire concept of an "occupation" in Gaza has been made moot after the 2005 Disengagement. "The root cause of the violence that burst from Gaza is not Israel’s occupation in Gaza, for a simple reason: Israel doesn’t occupy Gaza," Netanyahu explained. "Israel left Gaza to the very last centimeter, to the very last inch. We uprooted all the settlements and vacated all the settlers. So there is no Israeli occupation of Gaza." Netanyahu then pointed out that Ban justified Hamas's rocket barrage despite the fact that it used the UN's own facilities to break international law.